c̓əsnaʔəm, the city before the city is an historic partnership of three Vancouver institutions: the Musqueam Indian Band, the Museum of Vancouver, and the Museum of Anthropology at the University of British Columbia. All three explored this extremely significant ancient village site on which part of Vancouver was built. 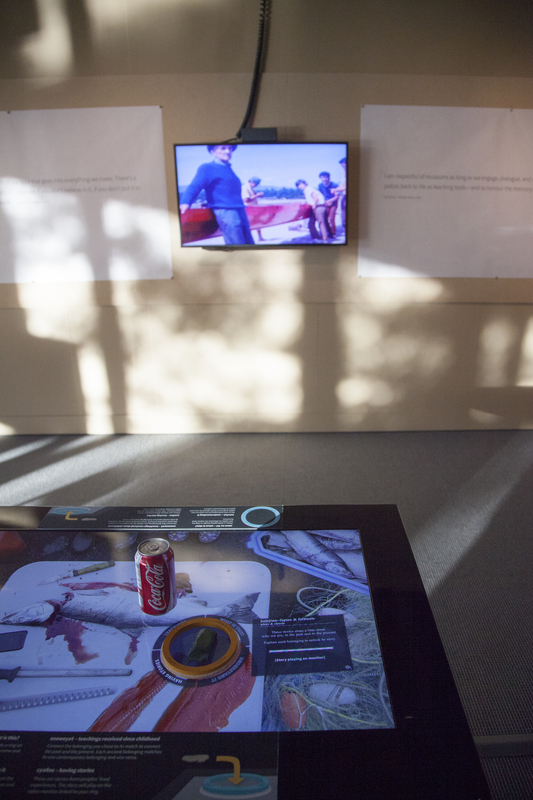 In the three different exhibitions, visitors were not only taught about the past, but about Musqueam culture and community today. 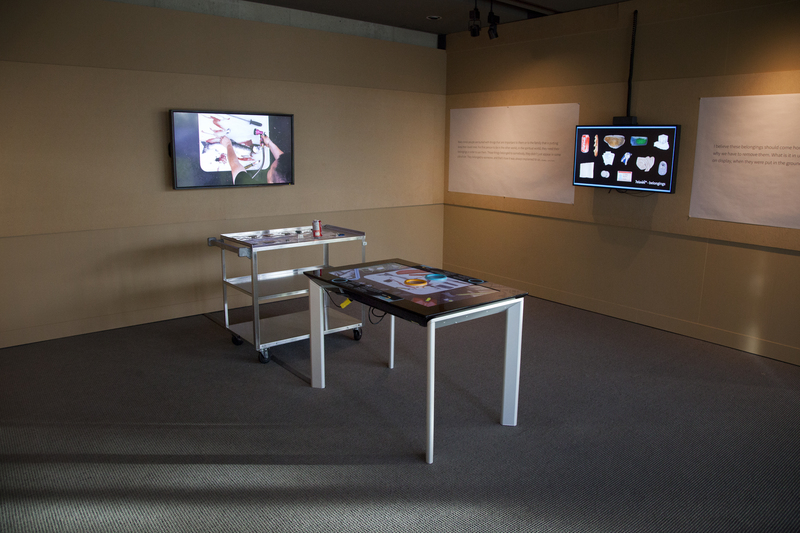 In collaboration with the Musqueam Advisory Committee for c̓əsnaʔəm, the city before the city, Dr. Susan Rowley, Jordan Wilson, and Lisa Uyeda at the Museum of Anthropology at UBC (MOA) worked with Dr. Kate Hennessy, Dr. Alissa Antle, Reese Muntean, Brendan Matkin, Rachael Eckersley, and Perry Tan at Simon Fraser University’s School of Interactive Arts and Technology to develop an interactive tangible tabletop called ‘ʔeləw̓k̓ʷ – Belongings’ as a component of the exhibition at MOA, which ran from January to December 2015. 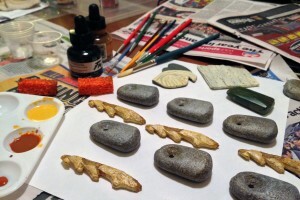 ʔeləw̓k̓ʷ – Belongings from Kate Hennessy on Vimeo. ʔeləw̓k̓ʷ – Belongings uses tangible replicas of Musqueam belongings excavated from c̓əsnaʔəm, as well as contemporary objects that are a part of everyday Musqueam life to represent the long history of salmon fishing and the continuity of related knowledge at c̓əsnaʔəm. Drawing on contemporary community voices and Musqueam’s ancestral language hən̓q̓əmin̓əm̓, each replica has its own story to tell. 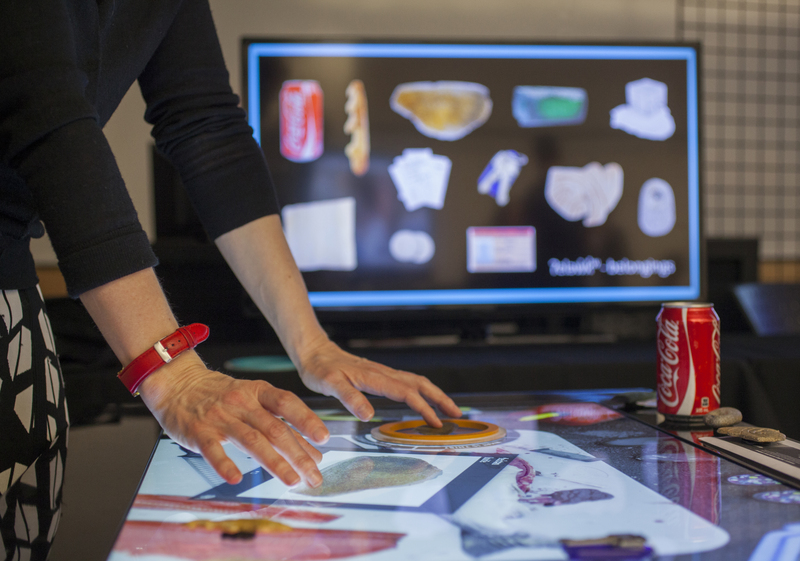 Placing a replica into an activation ring on the tabletop enables visitors to explore each belonging from multiple and interrelated perspectives. A digital version of the ring translates the hən̓q̓ əmin̓ əm̓ terms that are etched into the wooden ring. Each segment of the ring represents a hən̓q̓ əmin̓ əm̓ concept and reveals deeper layers of meaning about the belongings. To access these layers, visitors must accomplish different interaction sequences akin to matching games to complete each segment of the ring. 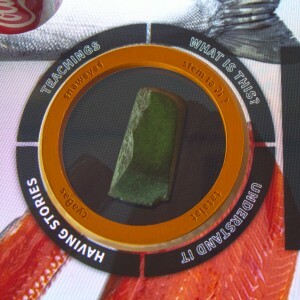 For example, visitors must move a replica of a net weight to the related area on the underlying fish-cutting image, the fishing net, to trigger media that describes fishing practices. Digital information appears in the form of historic documents, smartphone photos from community members, quotes, and informative text. When the first three of these interactions are completed, the visitor unlocks a video interview with a video interview with a community member, who shares stories about learning cultural practices and histories. The table invites visitors to learn through interaction about the many cultural and historical meanings of belongings from c̓əsnaʔəm, and about how technological knowledge associated with activities such as salmon fishing have a fundamental place in Musqueam history and persists today as part of everyday life. 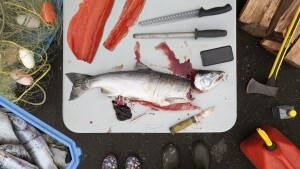 c̓əsnaʔəm: The City Before the City from MOA on Vimeo. See more on our development page.